IODE Louisbourg Chapter received its charter on October 8, 1910 when 44 women form Sydney formed the first IODE chapter in Nova Scotia. They met at the home of Catherine MacLellan, the curator at the Fortress of Louisbourg. To this day members have maintained their interest in the historic fortress. The name changed to Louisbourg-Ceilidh in 1999 when the Louisbourg Chapter jointed with the Ceilidh Chapter in Sydney River. This year marks the 105th Anniversary of the formation of the Louisbourg Chapter. IODE Louisbourg-Ceilidh Chapter recently celebrated its 105th Anniversary. 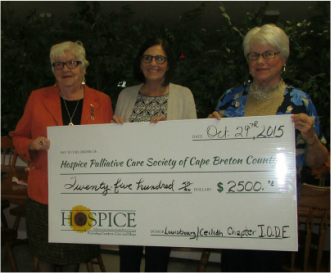 As part of the celebration, chapter members donated $2500 to the Hospice Palliative Care Society of Cape Breton. Shown here making the presentation to Nancy Dingwall (c) - Hospice Society Co-Chair are Marion Hopkins - President (l) and Carol Ross, IODE Services Officer (r). Each year scholarships are donated to Riverview High School, Sydney Academy High School and Cape Breton University to deserving students to help them further their education. In addition donations of books have been made to the local library. The chapter works within the community to support local organizations such as Transition House, a temporary home for women and their children who are escaping domestic violence. They are provided comfort kits which contain toothbrush, toothpaste, comb, towel and other personal care items. At Christmas they receive donations of pyjamas and slippers. The men's homeless shelter in Sydney is another area not forgotten by chapter members with donations of food, as well as winter wear such as socks and hats. Recently members have been providing healthy breakfast and snack items for Riverside Elementary School. Clothing is also donated to the hospital neo-natal unit. Members of IODE Louisbourg-Ceilidh Chapter collected many items of children's outerwear to donate to the Clifford Street Youth Centre in North Sydney. Pictured here is Carole Ross, IODE Services Officer, presenting the clothing to Paul Ratchford, Coordinator of the Youth Centre. As with all IODE chapters members attend and participate in Remembrance Day Services at the cenotaph. Citizenship Courts are also a priority among members helping to make new Canadian Citizens feel welcome. Frozen Pie Sale - During September and October members take orders for frozen pies that are purchased from the Annapolis Valley. Pies are distributed in November in time for Christmas. Yum, Yum. Each fall we hold a Home Cooking, Book and Novelty Sale at the Mayflower Mall. A Mother's Day Tea and Sale has been held annually for many years on the Saturday prior to Mother's Day; this event has become a tradition for many community members. Early each June we hold a Yard Sale ... we are always amazed by the number of items we receive and the number of people that come out to support us. Meetings are held at 12:30 pm the first Thursday of each month except for July and August... new members are always welcome.